Dean Ainslie speaks with Mark and Carolyn Ain. When it comes to supporting Simon and the University, Mark and Carolyn Ain have helped set the standard for meaningful gifts. 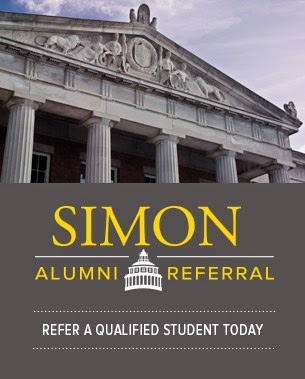 Without question, Simon relies on the generous support of our alumni and friends to fulfill our mission as a top US business school. To better understand what makes alumni give back, I recently spoke with Mark and Carolyn Ain at their Florida home. It was an absolutely beautiful setting, and as we watched pelicans dive into the ocean to catch their food, we talked about how Mark’s experience as an entrepreneur influences his giving, and why Carolyn finds giving back so rewarding. It was a wonderful opportunity to hear from two of our biggest supporters. I’ve shared much of our conversation here, but if you would like to learn more about this outstanding couple and their commitment to giving, I invite you to watch the video. AA: My first question is for Mark. How did you end up at Simon Business School? MA: I was actually in the first full-time class at the University of Rochester MBA program. It wasn’t even called Simon back then. I had graduated from MIT, then spent a year traveling in Europe and working in New York City. During that year I decided to apply for an MBA. To be honest, Simon offered me tuition and a monthly stipend, so it was a very easy decision. I also knew about the University because my younger brother was a student there at the time. AA: You’ve told me before that one of your favorite professors actually was a behavioral professor, somebody who was more on the side of trying to understand leadership and understand how organizations work. MA: Absolutely. His name was Ed Henry. He had retired after 30 years working in, and eventually heading up, HR for Esso, which is now Exxon. He decided to come to the University of Rochester as a professor and teach a course in organizational behavior. The second year the course consisted of going over to his house one night a week. We all brought something to eat, and he would invite his friends, who were heads of HR at various big companies like General Electric, General Motors, and others. We learned so much about how companies worked and the reality of leadership with him. AA: Carolyn, how did you and Mark first meet? CA: I think many people know this story, but Mark and I met through a personal ad in Boston Magazine. This is going to date us, because it was before the days of meeting online. There was a personal section in that magazine. One day, my oldest daughter came to me and said, “Mom, I’ve looked at some of these people who have advertised in here and five of them sound good. You should call them.” I got a little defensive and said, “Well, I’m not doing anything with you standing right here.” But I did it: I contacted Mark. We talked on the phone, had lunch together, and it went from there. AA: Here’s a question for both of you. What is the secret of a really good marriage? MA: We have six children between us, and we speak to our children and our grandchildren with one voice. I think that’s very important. We have a lot in common, especially views on life and spirituality and children and grandchildren. CA: And I think that we also have tremendous respect for each other, even when we disagree, which is bound to happen. That’s very important, too. AA: Let’s talk a little bit about philanthropy, because that must have been one of your conversations when you were learning about each other. MA: Sometime before we met, I became involved in a school for emotionally disturbed boys and girls. I introduced Carolyn to the school, and she served on the board with me. That sort of started our philanthropic career. We thought about it a lot, and decided that we wanted to help young people. AA: I suppose that somehow morphed into what you’re doing now. You’re affecting so many young people at Simon. CA: It really has. It’s not just about philanthropy; at least it wasn’t for me. When I was in college, I was doing things that I thought would be beneficial to people. I lived in Virginia for a time, and did some work in underprivileged communities. I would work with the kids in kindergarten through second grade and read to them after school. I would do whatever I could to help those kids. I wanted to make a difference. AA: Mark, what were you thinking about when you decided to get more involved with the Center for Entrepreneurship? MA: Well, early on in my career I decided I wanted to be an entrepreneur. Both grandparents came to this country and became entrepreneurs. And growing up, my grandmother instilled in me the sense of charting my own destiny and being my own boss. In college, we used to stay up late talking about what we wanted to do. I always knew I wanted to start a company. So that’s what I did, and I was reasonably successful doing so. When it came time to think about what I wanted to do with philanthropy and give back, the natural thing was to help people become entrepreneurs. AA: Let’s talk a little bit about your company, Kronos. MA: I was a consultant in the Boston area with a small firm that mostly did product planning and market research work for Fortune 500 companies. After three and a half years, I left and started my own consulting business. My idea was to think about a product and start a company around it. In early ’77, I stumbled upon the old mechanical time clock, which actually was invented in Rochester in the 1890s. I realized it was right for automation, and microprocessors had just been invented, so I decided to go for it. AA: How many people does Kronos employ today? MA: We employ around 4,500 people worldwide. AA: Was there a moment when you said to yourself, “This is going to work”? MA: Well, the early years were very hard. I never raised a lot of money in any one round. I never took money from people who wanted to buy preferred stock or convertible securities, because I wanted them to have the same rights on their stock I had on mine. To be honest, if I hadn’t done that, they probably would have kicked me out. But I kept raising money. We grew revenue every quarter, quarter on quarter, year on year, for something like 118 straight quarters. We finally got to a point in ’86 or ’87 when it became profitable. That’s when I realized that although we weren’t out of the woods, we were on our way. AA: What’s the thing you took away from Simon that most helped you in your career? MA: I think the major in Organizational Behavior and Ed Henry. I wrote a thesis my second year on leaderless group discussion. And that thesis taught me a lot about how to get people to express what they wanted to express and how to interview and find leaders in a group. AA: What do you think is the most important lesson you’ve had as an entrepreneur that students should know? MA: I guess the most important thing is to find a mentor—early on, before or when you start the company. Having at least one mentor who is local, who you can meet with regularly, who you can call, who will stop by and offer their perspective. You need someone who’s been there, done that, and won’t get caught up in the day-to-day details of what you’re doing. AA: You’ve said one of your favorite projects is the business plan competition. How did you come to create that? What got that off the ground? MA: I realized that one of the best ways to train people to be entrepreneurs is to have them write a business plan around an idea. We started the competition around that and opened it to anybody at the University of Rochester. Fortunately at Rochester, there are a lot of ideas and a lot of patents, so even if students don’t have their own idea, they can go to the technology licensing patent office and find one. I think this will be the 11th year of the competition. AA: Why is entrepreneurship so important? MA: Entrepreneurship is important because it invigorates the economy. Companies get old and stale, and if they don’t have competition starting in their area that’s more nimble, that’s doing new things, they don’t innovate. That’s why most companies die of old age. I think entrepreneurship also invigorates societies. It generates new ideas and excitement; it gives young people something to get involved with and think about, and you’re kind of reinventing yourself and society as you go. AA: In what ways do you think your philanthropy will benefit entrepreneurship at Simon? CA: I believe it’s more than just handing somebody a check or a way of covering costs. What Mark has done by starting and financing these programs at the University of Rochester is teaching students what they might not learn in a classroom. He is a true mentor, and that is a game-changing situation. MA: Simon didn’t have a real entrepreneurship program when I visited. I thought there was so much to do and so much to give, and I just felt that Simon was the place where I could make a difference. AA: You also play a critical role in the Student Incubator at High Tech Rochester. Can you tell us about that? MA: For the last five or six years, Carolyn and I have financed the incubator. In the early days, there were one or two companies there. Now, it’s overflowing with companies, and many of them have been either winners in the Mark Ain Business Plan Competition, or they’ve won second or third prize. When I visited in October, there were at least three, maybe four, companies that are on their way to being successful. AA: Carolyn, you mentioned some of the relationships you and Mark have developed through the Ain Center for Entrepreneurship. Can you tell us a little bit about them? CA: It’s been very rewarding. We’ve found that the young people we’ve worked with and mentored have become friends. We’ve just had the best time getting to know, seriously know, so many people. MA: Particularly ones who move to the Boston area. AA: Why do you think people should give back to their alma mater? What would you say to encourage them to do that? MA: I think they’ve got to visit their alma mater, and they’ve got to find something that grabs them, that interests them, that turns them on, and find where they can make a difference. It’s as simple as that. Being a member of the University’s Board of Trustees, I’ve met some of the most outstanding people from all different fields—and they are all University of Rochester graduates or associated with it in some way. It’s very rewarding that students who graduated four or five years ago still stay in touch and seek advice. We still get together periodically. It’s almost like having another set of children.